His Holiness Sakya Trizin's third visit to the Dechen Community came in March 1989. 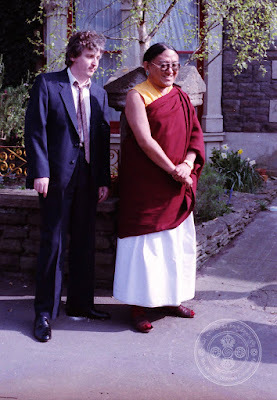 The visit lasted for two days and once again His Holiness was hosted by Sakya Thinley Rinchen Ling in Bristol. On the first day of the visit His Holiness gave the torma initiation of Vajrakilaya from the Khon lineage. On the second day His Holiness gave the initiation of Vajrapani Bhutadamara, followed by a public talk in the evening. In between His Holiness's second and third visits, Lama Jampa Thaye made his first visit to India to receive teachings from His Holiness in His private shrineroom. Lama Jampa spent a month with His Holiness in 1986 receiving the profound and esotoric instructions of the Thirteen Golden Dharmas, as well as a number of reading transmissions. The only other people attending the initiations were His Holiness's two sons, H.E. Ratna Vajra Rinpoche and H.E. Gyana Vajra Rinpoche and the Sakya abbot Chiwang Tulku, an old friend of Karma Thinley Rinpoche. Lama Jampa Thaye will bestow the initiation of one of the deities contained in the collection of the Thirteen Golden Dharmas, Black Manjushri, in London in December this year.